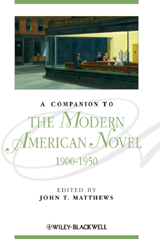 This cutting-edge Companion is a comprehensive resource for the study of the modern American novel. Published at a time when literary modernism is being thoroughly reassessed, it reflects current investigations into the origins and character of the movement as a whole. Brings together original essays from leading scholars. Allows readers to orient individual works and authors in their principal cultural and social contexts. Contributes to efforts to recover minority voices, such as those of African American novelists, and popular subgenres, such as detective fiction. Directs students to major relevant scholarship for further inquiry.